Rachel Perrin Rogers, the chief district legislative assistant to Senate Majority Leader Wilton Simpson who has filed a sexual harassment complaint against Sen. Jack Latvala, has asked for security guards. Rachel Perrin Rogers, the high-ranking Senate aide who accused Sen. Jack Latvala of groping her and making lewd comments about her physical appearance, has asked for security guards at the Capitol. Perrin Rogers's lawyers, Tiffany Cruz, sent a letter to Negron on Thursday blaming Latvala and his supporters of forcing Rogers to go public, and accusing the Clearwater Republican and his paid minions of "engaging in serious acts of retaliation" against Rogers, "both directly and indirectly through attempts to harm her spouse's employment." Perrin Rogers is married to Brian Hughes, a GOP consultant and former spokesman for Gov. Rick Scott whose clients include attorney general candidate Frank White and Baxter Troutman, who's running to succeed Adam Putnam as ag commish. Tiffany Cruz, Perrin Rogers's lawyer, said she wants a Capitol Police or Florida Department of Law Enforcement officer to be assigned to the Senate staffer as she enters and exits the building and while she's in her office because she doesn't feel safe. The complaint, filed with the secretary of the Senate Friday, accuses Perrin Rogers of "displaying a pattern of harmful and retaliatory behavior" toward Lily Tysinger, a former Senate Majority staffer who's backed Latvala in the increasingly toxic sexual harassment investigation. "Ms. Perrin Rogers is requesting that someone from Capitol Police or FDLE be provided to her this week while she will be working in the building. She would like someone to be with her when she comes in the building from the garage and when she leaves as well as to remain in her office area whenever she is there," Cruz wrote to Office of Legislative Affairs General Counsel Allison Deison in an email sent Saturday morning. Perrin Rogers "does not feel safe with Lily Tysinger in the building and having access to her and her office in light of Ms. Tysinger's past and present conduct," Cruz wrote. "If this is not an option, please advise so we can independently retain a law enforcement officer to be present." Tysinger filed a whistleblower complaint Friday accusing Perrin Rogers of numerous workplace violations, including "engaging in a pattern of conduct" designed to "intimidate me due to my status as a witness" in the Senate investigation into Latvala's alleged sexual misconduct. Again, Cruz said late Sunday she was unaware of the complaint, which came a day after Cruz asked Negron to intervene on Perrin Rogers's behalf because of intimidation. "While the Senator has the right to deny the allegations, he does not have the right to spread false and defamatory information about the complainant to the public in an effort to discredit her claims," Cruz wrote. "I expect that as his employer, you will ensure that this retaliatory conduct is not tolerated." Negron's spokeswoman, Katie Betta, did not respond to a request for comment over the weekend. Cruz said Saturday she had not yet heard back from the president or his aides. 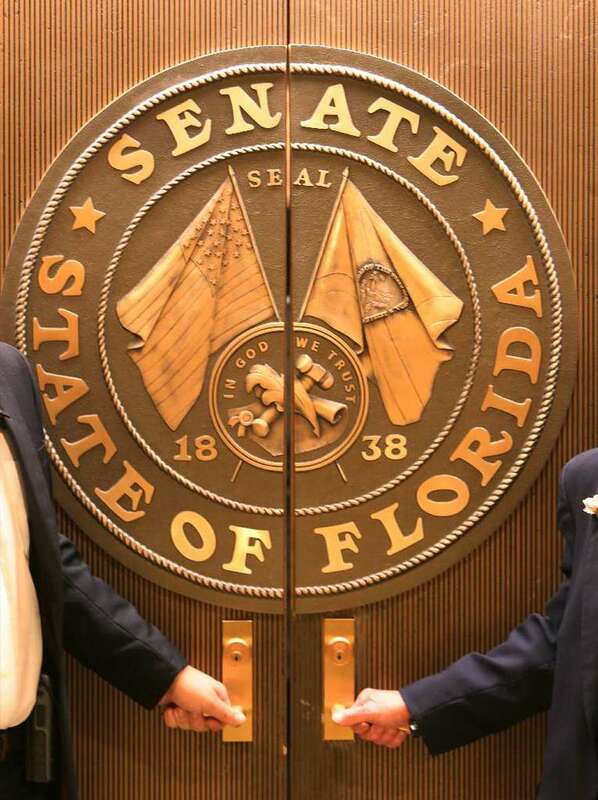 Latvala's lawyer, Steve Andrews, denied that the senator's team had done anything to intimidate the senate aide or her spouse. "Absurd," he said in a text message. Cruz also asked for — and was granted — extra staff to essentially provide a buffer for Perrin Rogers, whose office is located near Simpson's inside the Senate Majority Office. "Since next week is a committee week and my client will be back in the Capitol working, she said it would be helpful if the Majority Office could have a receptionist and/or administrative assistant sitting out front. This would prevent people from coming in to her office without permission," Cruz wrote in an email to Deison Wednesday. "The Senate will make sure that there is an assistant in the front of the Senate Majority Office next week," Deison wrote back Friday morning.